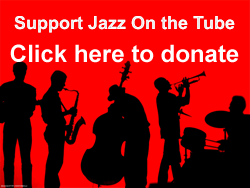 Jazz on the Tube is the biggest annotated and indexed online collection of jazz videos on earth – and it’s free. We spend hundreds of hours searching the Internet each year for great jazz videos so you don’t have to. 2. A free Video-of-the-Day service. Love jazz? We deliver a great jazz video to your mailbox every day. You can subscribe here free. 3. The Internet’s only free up-to-date world-wide directory of jazz clubs, jazz festivals, jazz radio stations, and jazz organizations. 4. A podcast series, unique in jazz, that features in-depth interviews on the history – and future – of jazz with jazz scholars, educators, and presenters. 5. One of the most detailed educational resources available anywhere on the music of Cuba and other Latin countries and their under reported, and often under appreciated, impact on jazz past, present and future. Here’s a partial list of artists in our jazz video vault.